I'm Krissy, proud creator of In Rocca We Trust. I live near Detroit and I used to live in Chicago. My nickname is the Bluesgirl for a few reasons 1. I love The Blues Brothers, 2. I love blues music, and 3. and when I lived in Chicago, I would go to blues bars frequently. I love music and The Daily Show, if either was to be lost amongst our modern world, I would not exist. I play bass guitar, electric guitar, alto and tenor sax, and a little bit of piano. I even write my own music. Some of my favorite artists are The Blues Brothers, The Temptations, Mudvayne, Godsmack, Slipknot, Queens of the Stone Age, The Murderdolls and The Beatles. I also love to write fanfics and when I get one done I'll put it on my site, I promise. I also love to draw and paint. In fact, I sent a picture to Mo that I drew of him and he sent it back to me, I promise I'll try to post that some where soon. People tell me I'm very smart and when I graduate High School I want to either be a comedy writer or Mortician. People also tell me I have a contradicting personality. I'm also into Anne Rice books and make my own Mo inspired wardrobe because I don't want to fit into the conformity of the American society. 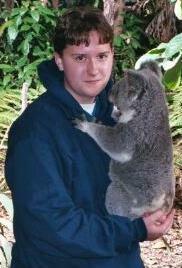 Me holding a koala on my trip to Australia and New Zealand.